Puffer Fish remains one of the most fascinating underwater creatures due to their ability to inflate their body to become a silly odd-looking ball shaped appearance. As interesting as they can be, this is the main attraction that makes people want to keep them as pets and most hobbyists actually end up failed in their attempts due to the lack of understanding on their requirements. As mysterious as it can get, nothing is a secret as long as you search more information and learning through experience. Most of the common puffers that you can see sold in pet stores belong to the Tetraodontidae family, also known as the four-toothed puffers, in which two of the teeth are located at the top and the other two at the bottom. 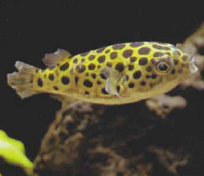 Some of the popular species belonging to this group that are generally found are the Leopard better known as Green spotted puffer (Tetraodon fluviatilis), Figure eight puffer (Tetraodon palembangensis), Black spotted puffer (Arothron nigropunctatus) and the Dwarf puffer or sometimes called Pea puffer (Carinotetraodon travancoricus). Most of them spent a large part of their life time in marine saltwater condition but their juvenile and early periods of their life are most in fresh/brackish water, thus this the first and foremost thing you will need to know before you even get started. Pictures of commonly kept aquarium puffers. 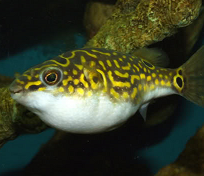 Puffer fish can be very territorial and they are best kept as single species housed in their very own tank. They love crustaceans and the young puffers are mostly fed with small crayfish, shrimps or if you have aquarium snail infestation taking place in your tank, they will actually do a very good job of ridding of the pests. They are also known to have a veracious appetite and most of the time they will finish off every tiny bits and pieces of foods given to them. If you are unable to supply them with shrimps which can be costly over long period, you can actually use chopped or minced fish meat as a replacement. That being said, you will definitely need a good aquarium filtration system (Eheim or Fluval canister filter is fine) and a large tank capacity that can hold huge amount of water in order to cope up with their high demands and extreme generation of waste material due to constant feeding. If well-fed, you will notice that they will grow very fast and soon enough you will have to change to a brackish water condition as they grow older. Make sure that you maintain specific gravity (SG) of 1.008-1.018 when they are at the juvenile stage and increase gradually to the range of 1.018-1.025 when they get older. There are conflicting statements among aquarist as to when is the right time that they should actually make the switch from freshwater to the brackish/marine water condition, but usually the period given is about one to one and a half years. Porcupine Fishes also belong to the same puffer groups (as what they are aptly called) although they are classified into a separate family of their own called the Diodontidae. Most people do not really know how to discern between a Diodontidae and a Tetraodontidae but however, if you look closely at the porcupine fish, they only have a pair of teeth in which one is at the top and another at the bottom. One of the most commonly found species is the Diodon holocanthus (also called balloonfish) and similar like their cousins, you should always confine your pets to solitary tank. There are reports on how people manage to add catfishes or other aquarium species with bony plates (armor type) but most of the time even the larger size aggressive ones will fall prey to the poisonous toxin or from the bite coming from their strong beak-like mouth. Despite their aggression however, puffers are very entertaining creatures as they will swim around the tank as soon as they sense your presence. Sometimes those cheeky ones will even squirt water as you get closer, so this something you will need to be prepared of duck immediately. Children and kids especially will love them but please ensure that the hood of the tank is perfect securely leaving no room for access that will cause untoward incident that can lead to serious injuries. All in all, if you are looking for a cute puppy face fish friend and playful pet, then definitely the puffers will fit nicely into this category. List of other types of funny-looking fish friend.